finally- If their is a FISH, There is a way..
Got help from expert Rajaram K and finally succeeded to set up nano tank at my home. Back to subject..It has been over a week now.. and I am NOT sure if my tank plants are evolving or dying.. I am not an expert, but from the pictures I don't see any problem at all. Usually it takes couple of weeks to a month for plants to get established their roots before they start growing. Again it all depends on the plant species. Cut the damaged anubias leaves the ones having holes, it will eventually grow again. As plants require light and Carbon source to grow, If you supply good amount of light then do provide some carbon source, how about DIY Co2 with yeast generator or adding some Seachem excel? Looking at the pics I think carbon source is only thing your plants missing. Your tank is doing just fine. Keep Calm & be patient. 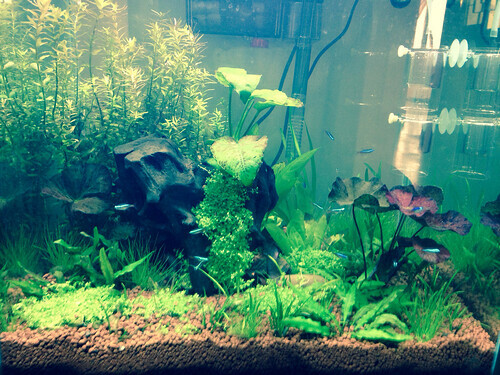 Vallisneria, lily & crypts will initially melt & then grow back. Swords are usually grown emersed (above water) in nurseries, so they will lose their leaves to grow leaves that will suit submerged conditions. dwarf grass will take time to catch up. Once it does, it will grow like a weed. 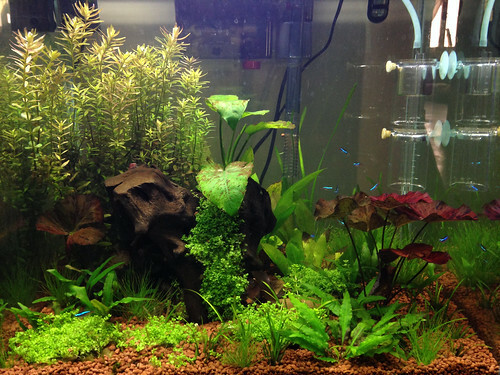 As for the Anubias, it is a very slow growing plant, so it will take time to show new growth. For now, keep up with daily 50% water change for 2 weeks. Then slowly reduce it to once in two days,then twice a week. Over a period of five to six weeks. However, I think you must plant more densely. Otherwise, you're asking for trouble in terms of algae in the long run. thanks all.. I saw some new sprouts and also just bought Seachem excel.. will start dosing it every alternative day..
please use it with care, dont over dose, I heard vals doesnt like excel much so keep a watch. Excel is just ok! Over the period of time, you will be tempted to overdose and will feel even overdose is not sufficient. Try DIY CO2 or if you can pressurized CO2. Initially plants do melt because of excel, but slowly they will get adapt to excel. Yes Vals don't like excel, they will show signs of melting at time they will melt die completely. Yes, My plants has started to recover and have added foreground plants HC Cuba, JHG, few shrimps and 2 Ottos to take care of clean up work. Sorry for hazy picture.. will post clean picture soon. 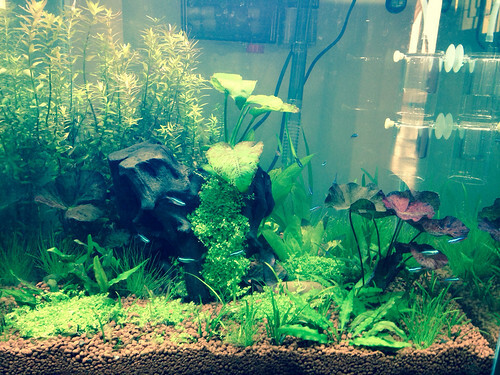 Valisneria can grow real quick and shadow the foreground plants , your tank is looking really great. Tank looks good. Try to use anubias in a shaded area and I think 10k light is too much for this tank. You will have alage faster.Try to reduce the lighting. One thing is the Aquaclay substrate you have don't support HC cuba or similar carpeting plants, go for grassy kind of carpet plants. Thanks.. Yupp.. this is the reason I have not removed mineral wool from HC Cuba and have fixed the mineral wool along with itself. I think this will help? What is your take on above method? Coming out nice. Patience pays in this hobby always :-) .. that was my all time learning here..
Is it okay and safe to keep the wool in the tank, for fishes ? My take is.. if at all HC cuba does manage to grow and start to carpet the substrate, one day eventually the whole carpet will be floating somewhere in the mid way of the tank.. The substrate is very porous and hence very light, It cant hold down plants on its own..hence you need plants which will root very deep..